Did you like Oreo Cookies? They were delicious no? And weren’t they absolutely perfect to turn into a pie crust? Well, in this recipe you can enjoy that same taste without using any cookies whatsoever. Luckily I stumbled across a recipe on All Recipes.com for a chocolate pie crust which I adapted and converted to gluten free. I can assure you that it is superb! The filling is only Mascarpone, white chocolate with a dash of cinnamon and brandy, which is then topped with fresh blackberries. I made individual tartlets but you can make just one large one. It looks difficult, but it honestly is so simple and quick to prepare! Makes a beautiful dessert! Whisk together the icing sugar, the flours, cocoa powder, salt and cinnamon. Stir in the melted butter and vanilla essence and combine with the dry ingredients. Press this ‘dough’ into the bottom and up the sides of greased individual fluted tart tins/molds or into a large one. Put in the oven and bake for exactly 10 minutes, until the middle bubbles slightly. Do not over bake or it will become too hard. Leave to cool. Put the white chocolate in a small ceramic or glass bowl and place in the microwave. Melt the chocolate in 10 second bursts. Be careful not to burn. It should melt fairly quickly. Mix it and leave to cool slightly. Lightly beat the Mascarpone with a fork and when the chocolate has cooled down, add it to the cheese and mix well. Add also a dash of cinnamon and a splash of Brandy and again mix. Gently remove the pie crusts from the tins and place on serving plate/s. Fill the cavity with the Mascarpone mix. Put in the fridge for at least half an hour, so the filling will set slightly. 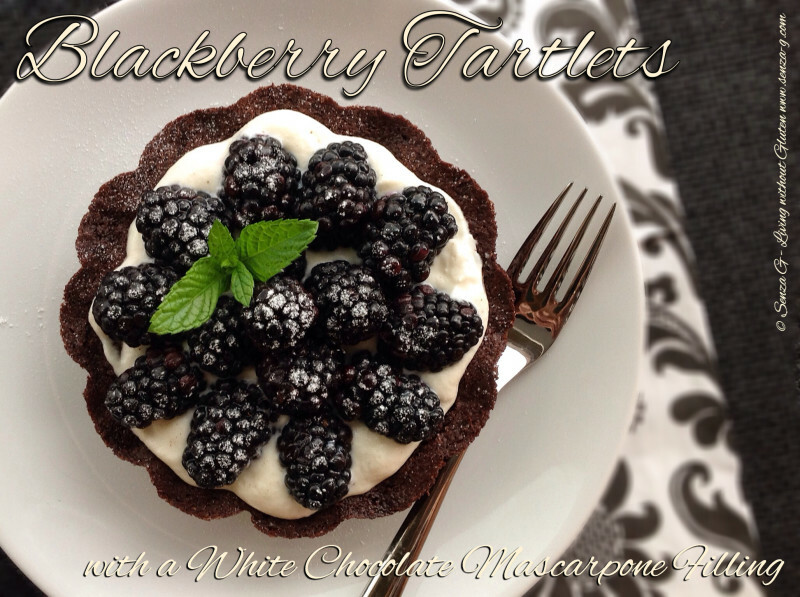 Take out and place the blackberries decoratively on top and put back in the fridge. Take out 20 minutes before serving. Lightly dust with icing sugar and garnish with a mint sprig.